Heat stroke, the most serious form of heat-related illness, happens when the body becomes unable to regulate its core temperature. Sweating stops and the body can no longer rid itself of excess heat. 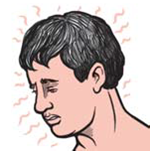 Signs include confusion, loss of consciousness, and seizures. 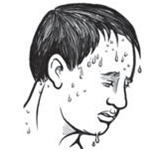 "Heat stroke is a medical emergency that may result in death! Call 911 immediately.